Mike Paton has spent a lifetime learning from entrepreneurs. Known in the EOS® Community as Paton, he works hard to give back—as a speaker, author, Certified EOS Implementer™, and as the Visionary for EOS Worldwide. During his journey, Paton teamed up with the creator of EOS (the Entrepreneurial Operating System®), Gino Wickman. 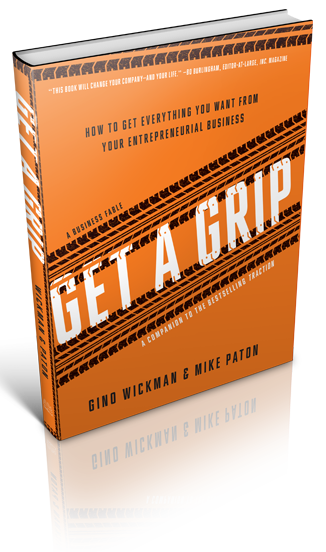 Together, they co-authored the second book of the Traction Library: Get A Grip: An Entrepreneurial Fable. Filled with familiar situations, real-world characters and detailed, fully-applied tools, Get A Grip vividly illustrates the pure way to implement EOS. The book is written as a fable, detailing the journey of the fictional company Swan Services in gritty, true-to-life fashion. We wanted to learn more about how companies can get the most out of Get a Grip, so we asked Paton to give us the inside scoop on the book. Traction Tools: Why did you and Gino decide to write Get a Grip? Paton: Very simply, the number one reason was to help entrepreneurs get what they want from their businesses by purely implementing EOS. We also had three other objectives. Number one, a lot of people are experiential learners—they learn and retain information better when they see things in real life than they do from reading a “how-to” lesson. As clear, simple and compelling as the book Traction is, we thought that telling a gritty, emotion-filled story would hook some readers and keep them more engaged and learning all the way through to the end. The second reason was to purely illustrate the way a Professional EOS Implementer takes his or her clients through the EOS Process™. In presenting the EOS Tools in Traction, it made sense to start with Vision and then work your way through the Six Key Components™ of a business. But when purely following the EOS Process, we actually teach “Traction first, Vision second.” We wanted to illustrate that clearly in Get A Grip. The final reason was to share more EOS Tools and concepts than we could in Traction, and to clearly illustrate the practical application of the tools in real-world situations. The narrative framework allowed us to do both of those things. In the end, the purpose was to tell a real-world, in-the-trenches story about what it feels like in a business that needs EOS, what it feels like to implement it purely, and what it feels like to come out the other end—running your business purely on EOS. TT: Who should read the book? Paton: It’s for entrepreneurs and leadership team members who may learn better from stories and illustrations than they do from how-to guides and manuals. It’s also a valuable tool for EOS Implementers. Frankly, it’s for anyone who wants to get a solid handle on what it looks and feels like to be in the trenches with an entrepreneurial leadership team. TT: What were some common confusions that you were seeking to clear up? Paton: We wanted to bring to life the journey of a “typical” entrepreneurial leadership team as they purely follow the EOS Process. We started with the discovery that the team and company had hit the ceiling, and walked through every step of the process, all the way to graduation. We wanted to show more than how to build and use a V/TO or an Accountability Chart. We worked hard to detail the personal conversations and the pain and the hell and fear and emotions around it. That’s what we wanted people to be clearly aware of. We wanted the book to be real and raw. Thus, Eileen is fantasizing about killing Vic at the start of the book. That’s real. Entrepreneurial leadership team members can go through stretches where they truly don’t like or respect one another—with violence seeming like a strangely reasonable course of action. If you have humans in your business, it’s likely to happen to YOU! We wanted to make that clear—to paint that vivid picture of just how hard it is to be a human inside an entrepreneurial leadership team. It’s a crucible. TT: And certainly when you’re making that transition to begin implementing EOS, sometimes the pain can be magnified. Paton: Correct. Simple doesn’t mean easy. And that’s another misconception we wanted to clear up. EOS is simple, but implementing it can be difficult and painful—as is anything involving people. The analogy I like best here is Mountain Climbing. I mean, how simple can it be? You just aim for the top of the mountain, put one foot in front of the other, and start climbing. When there’s no place “up” left to go, you win! How much simpler can it get? But it ain’t easy. TT: How have leadership teams responded to the book? Paton: Uniformly positive. A lot of people say that because it’s a fable, it more vividly painted a picture for them of what a company running on EOS looks and feels like. Many readers have observed they felt like we might have been “listening in” on their leadership team, because it feels so real. What a great compliment. In fact, the rule between me and Gino was that we wouldn’t put anything in the book that both of us hadn’t seen happen in a real client session at least ten times. So everything you read in Get a Grip has happened multiple times for both of us. TT: How do you recommend people use Get a Grip? Paton: There’s no hard and fast rule for that. When a Professional EOS Implementer is working with a client, they assign the book when it makes sense. It might be when a leader or the whole team is struggling with a particular tool or concept that Get a Grip presents in a “real world” way. For example, the conversation between Eileen and Carol can be helpful when a leader is preparing his or her first “three-strike” conversation with a direct report. I like to have fun with it, too. For example, when a leader is regularly late to sessions or Level 10 Meetings™, I’ll grab a copy of the book, put it on their seat before they arrive (late) to the session, and open it to the section where Vic comes to the meeting late. That usually makes the point, to great effect. If they haven’t read the book and they’re about to begin to run their own EOS Quarterlies and Annuals, I’ll ask them to read the book. At that point one member of the team is taking over the responsibility of being the character of Alan the Implementer, and they need to be prepared for that. I also give it to new Implementers when they graduate from Boot Camp, because that’s their life. I want them to know what it feels like to be Alan. One cute story: I did a session once for a client of mine and he argued with me, “That’s not the way Alan does it!” The nerve of that guy—I’m Alan! But there’s a point here: when you share with the world what pure EOS Implementation looks and feels like, it raises the bar for everyone. It keeps me and the rest of our Professional EOS Implementers on their toes. If you’re not purely implementing EOS, you’re going to be found out. TT: Anything else you want people to know? Paton: If you’re on a leadership team at an entrepreneurial company, I want to help you get what you want from your business. We wrote Get a Grip because we thought it would help entrepreneurs, period. If you read Get a Grip and it doesn’t help, call me. I want to help – heck, our entire community of Professional EOS Implementers want to help. We’ll spend some time IDSing with you. We’ll recommend some EOS Tools, some other books in the Traction Library, or other resources designed to help you get what you want. That’s what drove us to write Get a Grip, and that’s what drives all of us every day. We believe that a leadership team that purely implements EOS will run a better business and live a better life. That’s what I want people to know. TT: Thanks for your time, Paton! Get a Grip on Implementing EOS! Need help navigating the storms of implementing EOS at your company? Check out Get a Grip! Looking for great software to run EOS? Discover how Traction Tools helps you productively manage EOS tools—get a fast-track demo right now!